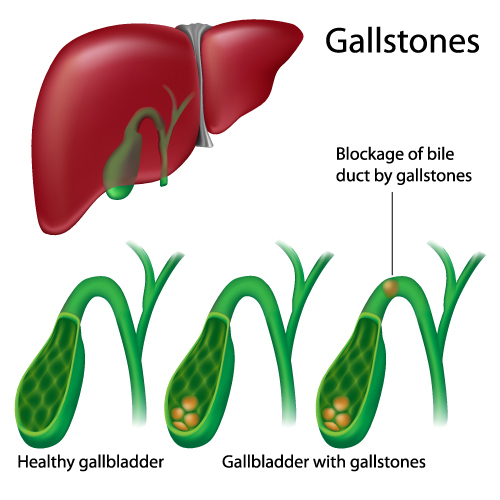 Gallstones are very common but can cause extremely bad symptoms. These include intense abdominal pain, sickness, vomiting fevers and jaundice. They can cause other serious conditions such as pancreatitis which may require emergency hospital admission. The gallbladder is a hollow, bag-like organ, approximately the size of a small pear. It is situated beneath the liver within the abdomen. This is on the right side of the body, just below the rib-cage. The main function of the gallbladder is to store the digestive juice bile, which is produced in the liver. Bile is an important factor in the digestion and absorption of fat within foods. It is continually manufactured by the liver and secreted into the digestive tract through the bile ducts. These eventually form a single channel (the common bile duct) which drains into the bowel at a place just beyond the stomach called the duodenum. WHAT ARE GALLSTONES – AND WHY DO WE GET THEM? Bile is a mixture of different chemicals (including cholesterol), and it is normally a liquid when stored in the gallbladder. However, under certain conditions, this liquid can form small crystals that develop into stones. This can take the form of sludge, multiple small stones or several large stones depending on their composition. It is uncertain as to what exactly causes stone formation, but it is probably a consequence of stagnation of the fluid in the gallbladder, combined with bacteria migrating in from the gut as well as genetic and possibly life-style factors. In our modern diet and lifestyle, we are probably not using the gallbladder the way nature intended. It is very effective for helping us deal with feasting after long periods of starvation, but becomes redundant when we eat frequent smaller meals and snacks, many of which can be high in fat and sugar content. Consequently, the gallbladder becomes less sensitive and doesn’t contract or empty so effectively. The fluids within it becomes stagnant and more concentrated which can then lead to stone formation. If you are suffering with Gallstones contact the South West Reflux team today.